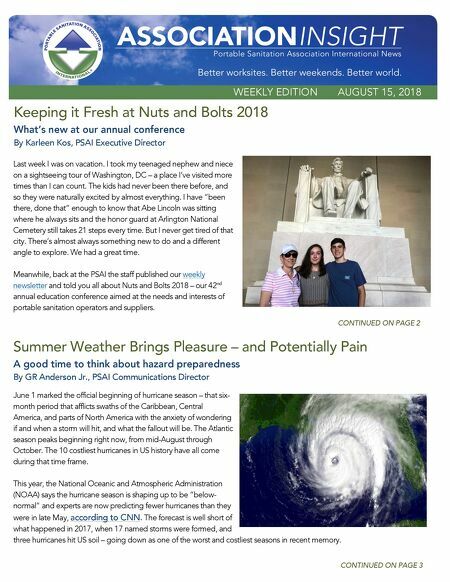 WEEKLY EDITION AUGUST 15, 2018 Keeping it Fresh at Nuts and Bolts 2018 What's new at our annual conference By Karleen Kos, PSAI Executive Director CONTINUED ON PAGE 3 CONTINUED ON PAGE 2 1 Summer Weather Brings Pleasure – and Potentially Pain A good time to think about hazard preparedness By GR Anderson Jr., PSAI Communications Director 2 June 1 marked the official beginning of hurricane season – that six- month period that afflicts swaths of the Caribbean, Central America, and parts of North America with the anxiety of wondering if and when a storm will hit, and what the fallout will be. The Atlantic season peaks beginning right now, from mid-August through October. The 10 costliest hurricanes in US history have all come during that time frame. This year, the National Oceanic and Atmospheric Administration (NOAA) says the hurricane season is shaping up to be "below- normal" and experts are now predicting fewer hurricanes than they were in late May, according to CNN. The forecast is well short of what happened in 2017, when 17 named storms were formed, and three hurricanes hit US soil – going down as one of the worst and costliest seasons in recent memory. Last week I was on vacation. I took my teenaged nephew and niece on a sightseeing tour of Washington, DC – a place I've visited more times than I can count. The kids had never been there before, and so they were naturally excited by almost everything. I have "been there, done that" enough to know that Abe Lincoln was sitting where he always sits and the honor guard at Arlington National Cemetery still takes 21 steps every time. But I never get tired of that city. There's almost always something new to do and a different angle to explore. We had a great time. Meanwhile, back at the PSAI the staff published our weekly newsletter and told you all about Nuts and Bolts 2018 – our 42 nd annual education conference aimed at the needs and interests of portable sanitation operators and suppliers.